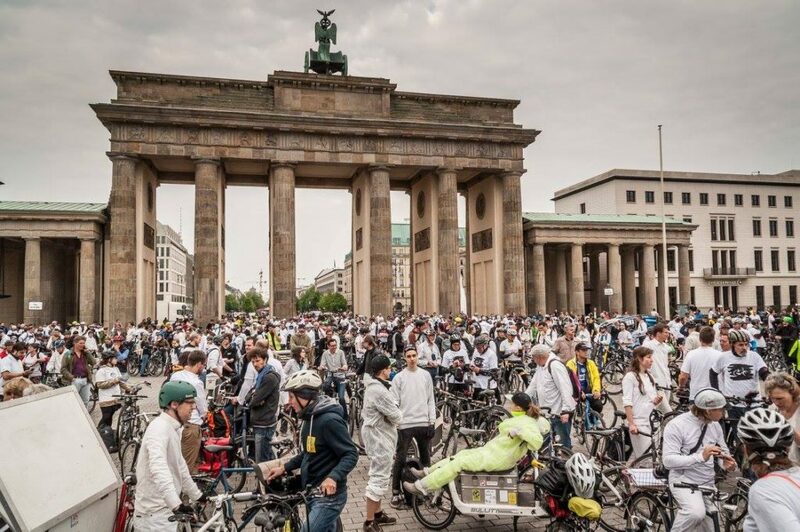 On Wednesday, May 17, around 1,250 people rode on their bicycles in silence, mostly dressed in white through Berlin. 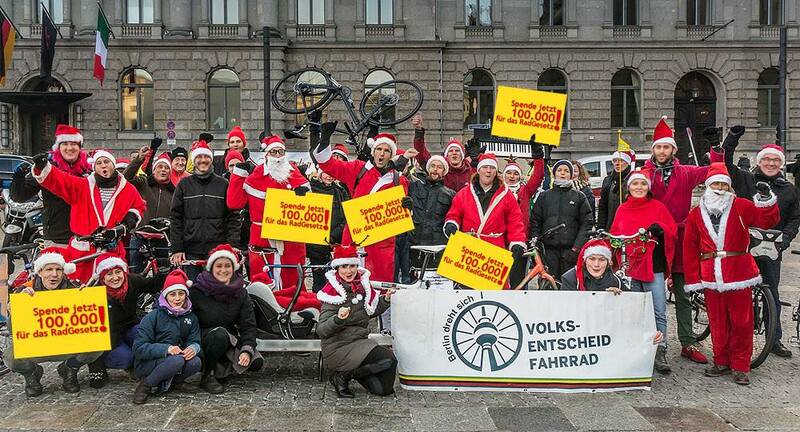 The demonstration was organised by ADFC, Volksentscheid Fahrrad and Autofrei Leben eV. to commemorate cyclists who died in traffic and as a sign to those responsible in politics and administration. Volksentscheid Fahrrad is a German nonprofit organisation that exists to create more equitable, sustainable, and people-friendly cities and urban spaces. They aim to bring about a major transition in the way mobility is practiced, away from the dominance of automobiles and towards sustainable and livable cities. As a campaigning organization, they aim to push forward the mobility transition from a bottom-up approach, and to go into spatial conflicts at the street level. They call attention to the injustice of the current distribution of space through media attention, especially by questioning and challenging the dominance of motorized individual transport, the ills of which are experienced on a daily basis. They aim to cause a cognitive shift in citizens, towards the health and sustainability of their cities and urban spaces. so that they may be more liveable and bring about long-overdue transformations. Contaminated air, noise pollution and feelings of insecurity outside of the vision of livable spaces. Volksentscheid Fahrrad organize people to bring attention to these issues to change the public discourse around transport and sustainability. 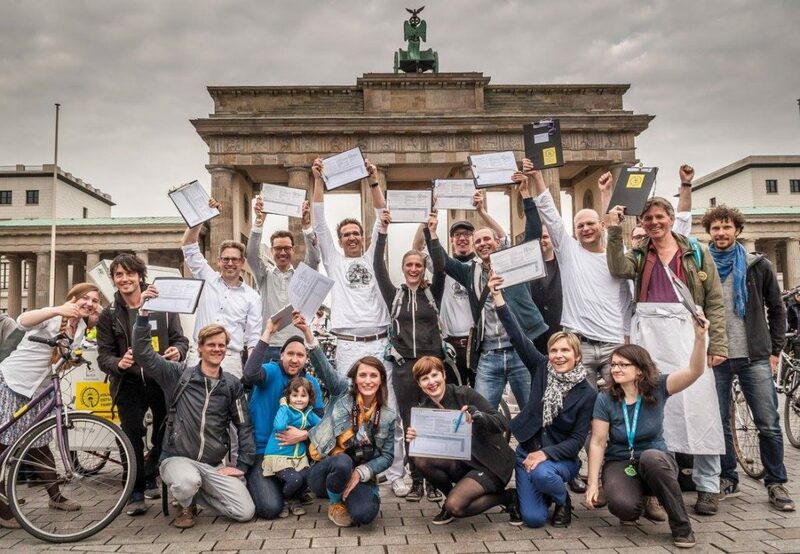 They are a mainly volunteer run organisation (2pt, 1ft positions) and although they were officially founded in 2016, they have already achieved some successes: In 2016, they presented a draft for Germany’s first bicycle law in Berlin. Within three and a half weeks, around 1,500 volunteers collected more than 100,000 signatures, so the political level in Berlin had to react. They are currently negotiating the cycling law with the Berlin Senate, which will improve the quality and quantity of the road infrastructures and should be adopted this year. The promising early signs are that they already achieved a public commitment by Senate to drastically increase spending for bicycle infrastructure. The Volksentscheid Fahrrad team starting to collect signatures, petitions in hand. The festive, holiday-appropriate celebration after having reached the 100,000 signature target for the bicycle law. Together with the ‘Mehr Demokratie e.V.’ Hamburg Group, the team will bring together varied initiatives surrounding the idea of direct democracy and sustainable people-friendly urban spaces. These initiatives will strengthen one another’s capacity to act in unison to influence their environments and cities. The Guerrilla funding will go towards a user-friendly, strictly non-partisan, internet platform will be developed to contain suggestions and recommendations for public awareness and public relations campaigning, the carrying out of petitions, civic participation and referendums and associated forms of direct democracy. The platform serves for transparent and accessible civic structures. All knowledge and contents on the platform will be publicly available. The creation and maintenance of the platform in the first phase will be the purview of the Berlin and Hamburg initiatives, but should be decentralized and further development should be carried out from the entire country. The source for the platform content will be Barcamps that the Volksentscheid Fahrrad team organise in various cities, starting in May and the platform will subsequently help to sustain the connections made there, allowing people to search for similar initiatives across Germany, and share good practices for lobbying, organising, mobilising, communicating, fundraising etc. 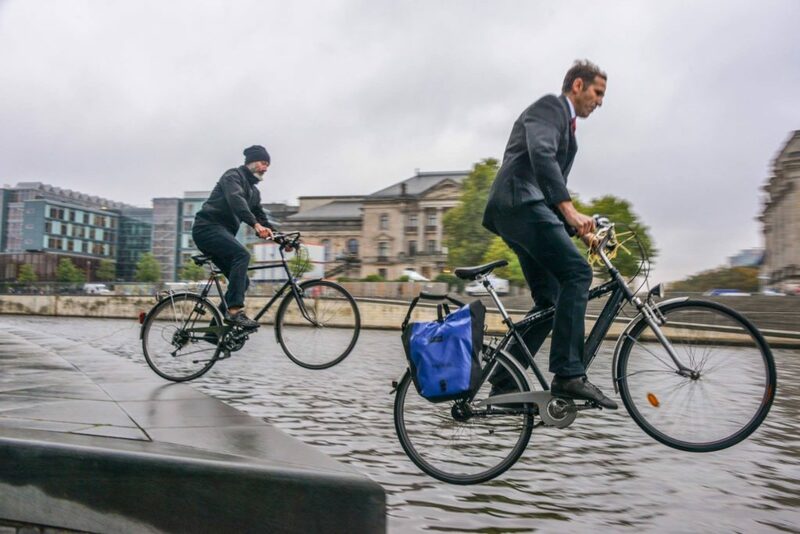 The Volksentscheid Fahrrad climate justice campaign that resulted in numerous cyclists taking the plunge in the water canals around Berlin, drawing attention to the idea that if do not meet emission reduction targets the waters will come to us.